Tina qualified as a dentist from the University of Pretoria, South Africa, in 2001. She completed one-year compulsory Dental Community Service and then worked at a few private practices until she established her own successful practice in 2006. 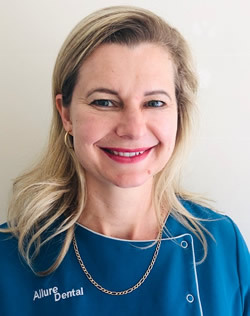 In 2018 she sold her practice and has made the move to Perth, Western Australia with her husband and two children. Tina comes with a wealth of experience from years in private practice and is confident in all fields of general dentistry, her favourite scope of work being cosmetic restorative treatment and crown and bridgework. Tina has a gentle, sympathetic and ethical approach to dentistry and loves working with children. Tina is available for appointments on Tuesdays and Fridays from 9.00am – 3.00pm. Contact Dr Tina for appointment.